To be useful, every computer system must have some kind of mass storage — a tape or disk drive, something to permanently store programs and data outside the computer's built-in memory. Here's a brief history of mass storage methods, a rundown of today's technology, and what developments we can expect in the near future. Eagerly you page through the latest issue of your favorite computer magazine. Searching for applications, you discover a game program that sounds fantastic, an educational program that looks fascinating, and a programming utility that is just what you needed. What if you had no way to store programs or data and had to type them in every time you switched on your computer? Or even worse, imagine having to take apart the computer and completely rewire it each time you wanted to change the program. Yet, that's what operators of the earliest computers were forced to do — and it wasn't that many years ago. The first electronic computer, ENIAC, a 30-ton behemoth which first came to life just after World War II, had to be programmed by hard-wiring. That is, it had to be physically rewired to alter its programming. And since it contained more than 18,000 vacuum tubes, rewiring ENIAC was no easy task. It didn't take long for computer scientists to realize the advantage of a stored program computer. This is a computer whose programs are stored outside the machine on some recording medium, and then temporarily loaded into the computer's memory when needed. This concept of mass storage or mass memory was a key step in the development of modern computers, because it made them more generalized and versatile. ENIAC was originally designed to calculate trajectories for artillery shells and bombs. When reprogramming was made easier by making it a "soft" process, computers could be applied to jobs that even the designers had not anticipated. Ironically, although some experts predict that today's computer revolution eventually will result in a society that is almost paperless, computers once devoured whole forests of the stuff. Punch cards and paper tape were the earliest media for mass storage. Both work on the same principle — the presence or absence of a punched hole indicates a bit (binary digit) switched "on" or "off." Punch cards long pre-dated electronic computers; they were first used in the 19th century to "program" weaving patterns on mechanized French looms. They turned up later on adding machines when the Census Bureau realized its manual counting methods could not tabulate the 1890 census in time for the 1900 census. Although punch cards and paper tape are still used in some places today, they were largely replaced in the 1960s by what has become the dominant storage method — magnetic media. Reels of audio tape and magnetic drums led to hard disks and floppy disks. Disk drives were invented to solve a problem with tape drives: to find a certain piece of data on a tape, you must first wind through all the intervening tape (sequential access). 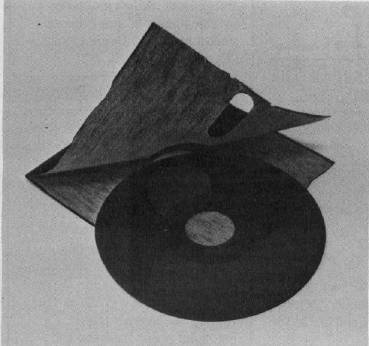 Then someone hit upon the idea of coating a flat plastic disk with the same magnetic material found on tape, so that a movable recording head could skip to the right spot in a split-second, just as a tone arm can be lifted to a certain selection on a phonograph record. This system of random access made it much easier to retrieve information. 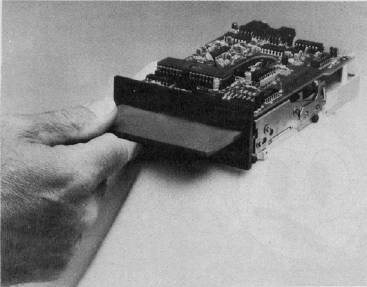 When personal microcomputers started appearing in the mid-1970s, the early hobbyists needed some sort of inexpensive mass storage device to hook up to their home-brewed or kit-built computers. As you've no doubt noticed during a power failure, all the information in a computer's Random Access Memory (RAM) disappears the instant the power goes off. That's because RAM chips need a constant flow of electricity to maintain the molecular alignments that indicate if a given bit is "on" or "off." Even if memory chips were designed to retain their data in a powerless state – as magnetic "bubble" memory chips do – there would still be a need for mass storage outside the computer. A typical computer owner's software library might consist of dozens or hundreds of programs, and there's no way they could be held all at once in the computer's relatively small built-in memory. And even if they could, they would interfere with each other. Arriving in the 1970s, personal computers pretty much skipped the paper methods of mass storage, although punch card and bar code readers are used on some microcomputers. Instead, the early computerists looked around and adapted audio cassette recorders as mass storage devices. Cheap and generally reliable, cassettes remain the most popular way to store programs and data on low-cost home computer systems. Unfortunately, cassettes suffer from one major problem: they are usually abysmally slow. While this doesn't matter much for casual applications, business users, advanced programmers, and others who need to frequently transfer large volumes of data just cannot afford to tie up person-hours and computer time waiting for tapes to load. 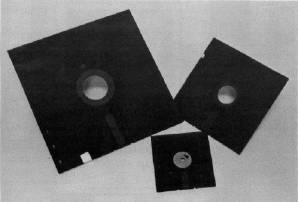 Having already borrowed the idea of tape storage from the world of large computers, microcomputer users next adapted disk drives to their small machines. By this time, there were two sizes of floppy disks (so-called because the magnetic layer is coated onto a thin, flexible sheet of plastic): 8″ floppies (pioneered by IBM), and 5¼″ minifloppies (pioneered by Shugart). Partly because the smaller disks seemed more appropriate to small computers, and partly because of their smaller cost, the 5¼″ size became the standard for personal computers. Both styles are similar, enclosing the disks in a vinyl dust jacket so that only a small section of the disk itself is exposed through a head window. When the disk drive is summoned by a command from the computer, the disk starts spinning at about 300 revolutions per minute, and a read/write head very similar to a tape recorder's playback/recording head is lowered into contact with the disk. The data is stored on the disk in concentric circular tracks divided into arc-shaped sectors. The amount of data a disk can store is determined by the number of tracks and sectors, and the density of the recorded information (single-, double-, or quad-density). Some disk drives have two read/write heads, one for each side of the disk, thus doubling a disk's capacity. The highest-density double-sided minifloppies can now store about one megabyte (one million bytes, or characters). Now that their prices are dropping, hard disks are becoming increasingly common on microcomputers. Unlike floppies, hard disks consist of a magnetic coating on a rigid aluminum platter which spins constantly, not just when the disk drive is called by the computer. They also spin much faster, as fast as 3600 rpm. (A floppy disk would quickly wear out under this kind of use, but the read/write head of a hard disk does not actually touch the surface.) Hard disks transfer their data much faster than floppies and can store much more information, up to 100 megabytes. Like floppies, hard disks come in 8″ and 5¼″ sizes. But besides their expense, hard disks have other drawbacks. The gap between the read/write head and the disk surface must be critically adjusted, and the disk itself must be centered exactly on its spindle. Also, hard disks are much more sensitive to dust or defects. That's why most hard disks are permanently sealed in their drives, unlike floppies. Since the disks are non-removable, they must be backed up on another hard disk, on floppies, or on tape. Still, hard disks are showing up in greater numbers on microcomputers used for business. Exposed — a 5¼″ minifloppy diskette removed from its protective sleeve. One of the less common mass storage devices found on personal computers is the stringy floppy. This is something of a cross between cassette tape and floppy disk. The medium is a small cartridge called a wafer, which is about the size of a business card and 3/16″ thick. Inside the wafer is a special tape designed for storing digital data. But instead of being wound end-to-end on a pair of spools, like cassette tape, wafer tape is wound in an endless loop, much like an eight-track audio cartridge. Tape lengths vary from five feet to 75 feet, and can hold up to 64 kilobytes (64,000 bytes). Wafers snap into a special stringy floppy drive which resembles an eight-track player. On some systems, stringy floppies can load and store programs as fast as or even faster than disk drives, and they usually cost less than a disk drive. Stringy floppies are most commonly used with Radio Shack TRS-80 computers. However, they may have found a new market in portable microcomputers, where their small size, high speed, and ruggedness make them viable alternatives to microcassettes and floppy disks. A newly announced portable aimed at business people, the Rover I, will use stringy floppies for mass storage. As technology advances, storage media seem always to shrink. For example, consider what's happened over the past 50 years to photographic film (which, after all, is just another method of storing information — visual information). In the 1930s and 1940s, most professional photographers worked almost exclusively with cameras that used 4×5″ sheet film. Smaller-sized film was avoided because the enlarged prints would turn out too grainy (that is, the film was incapable of storing visual information at a high enough density). But as film technology advanced, photographers were able to trade in their bulky 4×5″ cameras for lighter models using smaller film. In the 1950s, 2¼″ square film was very popular. This was superseded in the 1960s by 35-millimeter (1×1½). In the 1970s Kodak introduced the 110 format, and in the 1980s, the new disc film — in each case, roughly half as large as the previous format. The ability to record information at greater densities (more tightly pack the film's grain particles) has allowed smaller film and cameras with little, if any, loss of quality. Now we're witnessing the same progression in computer mass storage technology. Floppies begat minifloppies which have now spawned microfloppies. The main problem with microfloppies right now is that everyone cannot agree on a standard format. There seem to be three major microfloppies emerging — 3½″, led by Sony; 3¼″, led by Dysan; and 3¼″, led by Hitachi. Some people believe more than one format can coexist, while others maintain that one will eventually rule supreme. Which disk really has the inside track? Sony is off to a good start, largely on the strength of a $30 million contract to supply microfloppy drives to Hewlett Packard for a new line of business/technical computers. Also, a group of U.S. manufacturers has decided to follow the Sony standard. "What's going to establish the standard is the marketplace," points out Myles Tintle, general manager of Sony Data Products. "It probably will be the one that emerges as the dominant technology." The Incredible Shrinking Disk. At left is an 8″ floppy diskette; at right, a 5¼″ minifloppy; and in the center, a 3¼″ microfloppy. Are even smaller disks on the way? On the other hand, the competing formats also have factors in their favor — mainly, greater compatibility with existing computers. Even though all three types of miniature diskettes are known collectively as "microfloppies," there are significant differences which reflect various design philosophies. The most noticeable difference is in the nature of the media themselves. Both the Sony-standard 3½″ and the Hitachi-standard 3″ disks are encased in hard plastic-and-metal housings much more impervious to abuse than the vinyl sleeves found on 8″ and 5¼″ disks. They look and handle more like cartridges than "floppies." "You can actually stand on these disks without damaging the media," boasts a spokesman for Amdek Corp., whose microfloppies adhere to the Hitachi standard. Both the Sony- and Hitachi-standard cases include movable shields which protect the head window when not in use. The shield retracts automatically when the Hitachi disk is inserted in a drive; the Sony shield works manually. The Dysan 3¼″ microfloppy is unlike the Sony or Hitachi disks. The Dysan appears more like a shrunken 5¼″ or 8″ floppy. All three microfloppies, however, have metal hub rings, an improvement over their larger ancestors. Since the disk drive spindle does not directly grip the media, the holes are virtually immune to wear. And what is perhaps more important, the metal hubs have special holes or nubs which securely anchor the disk to the drive spindle and center it more accurately and consistently. This is vital because recording densities are much greater, so there is less tolerance for mistracking. Thanks to the denser recording, all the new microfloppies can store about as much information as most 5¼″ or even 8″ disks. Sony's microfloppy crams 437.5K (unformatted) on a single side of a double density disk, which means a double-sided version would approach a megabyte. It also revolves at 600 rpm, twice as fast as larger disks, which yields faster data transfer (throughput) and shorter access times. But these characteristics also make the Sony microfloppy less compatible with existing computers. On the other hand, Hitachi decided to go with less capacity and greater compatibility. Amdek's Hitachi-standard microfloppy stores 250K (unformatted) on one side of its smaller 3″ disk, or 500K (half a megabyte) per double-sided disk. It also spins at 300 rpm and is easier to interface to existing machines since it adheres to the 5¼″ Shugart standard. In other words, the microfloppy appears to the computer as an ordinary minifloppy drive. Amdek is selling a dual microfloppy drive, the Amdisk 3, which attaches to an IBM Personal Computer or TRS-80, at only $749 retail. The Amdisk 3 also works with Atari and Apple computers with an extra controller. Amdek also is introducing a single microfloppy drive for the Apple, with a built-in controller, that will sell for only $299. A similar unit is on the way for the Commodore 64. At those prices, microfloppies already are more than competitive with minifloppies. The media price is a bit higher — $55 for a box of ten Amdek disks — but that should drop with greater production. Amdek's assistant sales manager, Jerry S. Benson, Jr., says his firm is being flooded with inquiries. "You wouldn't believe the kind of questions we're getting over here," says Benson. "We get calls from people who want to know if they can hook up our $750 dual microdrives to their $99 Sinclairs. "We've also got a lot of interest from people who are designing portable computers, because they really have to go with the microfloppy technology," he adds. "It also greatly simplifies their design considerations, because we just tell them the microdrive works with a standard Shugart strip and they automatically know what we're talking about." Tandon's 3½″ microfloppy disk drive, the TM35, stores 875K per disk. It adheres to the Sony microfloppy standard. Like the Hitachi/Amdek, Dysan's 3¼ microfloppy also spins at 300 rpm, but manages to pack even more data than the Sony – 500K per side, or one megabyte per disk. And an even more exciting development is on its way from Great Britain: Sinclair's ZX Microdrive, which does not conform to any of the aforementioned systems. Although this still-unseen palm-sized disk drive stores only 100K per disk, Sinclair claims it will transfer data at 16K per second and sell for about $100. How could it be so inexpensive? One rumor has it that the ZX Microdrive is a sequential access device, like a tape drive. Whatever its secret, the ZX Micro-drive should appear, at least overseas, sometime this year. Obviously, there is no storage penalty for switching from mini- to microfloppy. In fact, most people will gain capacity. And if the drives cost about the same (Tandon Magnetics is selling both size drives at a manufacturer's cost of $200-$225), then what's left to stop the microfloppy revolution? Software, for one thing. If commercial software is hard to get on microfloppies, it will seriously affect their popularity. Amdek's Benson points out that programs such as VisiCalc will have to be readily available before microfloppies really take off. The smart companies are already courting the major software producers. And, of course, the ever-present standards battle will slow things for awhile. Many software producers and computer manufacturers may decide to wait until a clear winner emerges. Still, it seems likely that microfloppies will be the dominant mass storage device on personal microcomputers within a couple of years. Meanwhile, even greater developments in recording are on the way which will advance mass storage technology by quantum leaps. The one which is most promising, or at least the most impending, is known as vertical or perpendicular recording. This is a method of magnetic recording which will dramatically increase the amount of information that can be stored on a small disk. How does a five-megabyte microfloppy grab you? The secret is in the way the microscopic particles are aligned on the magnetic surface of the disk. Conventional recording stores information by aligning the particles horizontally, end-to-end. Vertical recording aligns them – well, vertically. It's sort of like the difference between a line of people lying on the ground head-to-toe, or standing upright. Naturally, you can get a lot more people into a room if they're standing up. That five-meg microfloppy is a bit down the road, but preliminary results are already impressive enough. Clark Johnson, president of Vertimag Systems, a small company in Minneapolis, Minnesota, says he has a working prototype of a five-meg 5¼″ minifloppy. Actually, Johnson says, a microfloppy would work even better, because the smaller disks are less affected by temperature and humidity changes and are thus more reliable for vertical recording. "A minifloppy is a sub-optimal application for this technology because it's limited to 96 tracks per inch for mechanical reasons," says Johnson. "The plastic shrinks and expands too much, and all the tolerances are too sloppy." Vertical recording requires a special magnetic coating on the disk, one that tends to magnetize vertically. Johnson is using a two-layer coating. The first is a half-micron-thick layer of nickel-iron permalloy, and the second is a cobalt-chromium alloy. The disks are actually easier to make than conventional disks, he says, because the coating is much thicker and therefore easier to apply. Although the coating is more expensive to make, he contends that vertical recording disk drives will be more than competitive with conventional drives – especially if measured in terms of dollars per megabyte. "It really doesn't cost that much more. In fact, the machine doesn't cost any more. The media costs more – maybe two to three times more – but it also stores more, and the price will come down. Johnson expects to have vertical recording drives in production by mid-1984. Oddly, he doesn't have much competition, at least in the U.S. "Almost none," he marvels. "Only the Japanese. And they're no threat to us because the market is so huge and we're just about the only U.S. company working on this thing. Very few people know about us at all. We're kind of just at the end of a line of a string out here, just doing our thing." Dennis Speliotis, whose Massachusetts consulting firm, Advanced Development Corp., is very active in vertical recording, says that only three or four small companies in the U.S. are exclusively working on the new technique despite "tremendous" interest. A few large firms, such as Control Data, 3-M, IBM, and Univac, also are reportedly interested, but none are as active as the Japanese. Toshiba has announced a vertical-recording floppy system, but it probably won't reach the market until late 1983 or 1984. Speliotis expects the first systems will use 5¼″ minifloppies, shifting later to microfloppies. The more stable smaller disks can easily hold 200 tracks per inch, he says, more than twice what Johnson says is possible with the larger minifloppies. Another new technology that has a devoted following is optical recording. This system dispenses with magnetics altogether and uses lasers to write information on disks and read it back. Proponents maintain that optical recording is more reliable than extremely dense magnetic recording, and is more archival (better able to store information safely for long periods). Research is taking several paths, but the essence of optical recording is coating a disk with a heat- or light-sensitive material, burning in the "bits" of data with a laser, and then reading it back by scanning with another laser. This is similar to home videodisc systems that use lasers. A big advantage is that since the read/write head does not rub the media — as floppy disk drives do — the disks can last much longer. Right now one of the problems holding back optical recording is the formulation of a coating that can withstand repeated writing and erasures. Magnetic media can be written to, erased, and rewritten hundreds of times. Since optical recording uses a laser's heat to "evaporate" tiny bits of material, the process is hard to reverse over and over again. Some proponents of magnetic recording contend that, barring a breakthrough, optical recording cannot achieve the densities of magnetic recording. Currently, optical recording is pushing against a diffraction limit which is approximately the wavelength of the laser's light — .75 to one micron. This means a limit of about 25,000 bits per inch. This is large when compared to current magnetic densities; the Sony double-density microfloppy records 7610 bpi. But Vertimag's prototype vertical minifloppy already packs 36,000 bpi, and Johnson expects 100,000 bpi in five years. And reportedly, some U.S. researchers who toured Japanese laboratories saw vertical recording under carefully controlled conditions which approached 440,000 bpi. Of course, the chances of errors or defects at these high densities are also much greater. Although the magnetic versus optical question is being fiercely debated, the prevailing opinion seems to be that magnetics will dominate reusable recording for the foreseeable future, and that optical recording will be used where archival storage is more important than frequent writing, erasing, and rewriting. Even more advanced technologies are being played with in the laboratories. Speliotis, the vertical recording consultant, says the Japanese are experimenting with something called magnetooptics. This seems to be an attempt to wed magnetic and optical technologies. A laser is used to affect a magnetic coating with heat; somehow, the intense neat alters the magnetic properties. Since the read/write head would be a laser, disk wear could be dramatically reduced. But Speliotis says the system is still stuck with the same diffraction limits as optical recording. Getting back to magnetics: now that we've seen full-sized floppies reduced to minifloppies reduced to microfloppies, will we see something even smaller? Tintle, the general manager of Sony Data Products, responds to this question by pointing out that Sony is preparing to market an electronic camera, the Mavica, that dispenses with film and records photographic images on a tiny, two inch magnetic disk. The disk and disk drive is so small that it fits in the back of the camera — which is about the size of a 35-millimeter singlelens reflex. Could we someday be using a super-minimicrofloppy for computer mass storage? "There's always that possibility," he says.